that works best for your schedule! Empty your car and bring your BFF to shop all the deals! 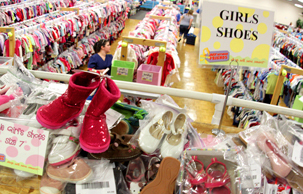 You'll find tons of clothes and toys children can use! We gladly accept cash, debit cards, Visa, Mastercard & Discover credit cards for payment! 4pm-8:00pm - Prime Time Shopping + Red JBF Discount Bag - Get Tickets before they are Gone!!! Open 10am - 7pm; $3 Admission (18 & older) Kids are Free! Get a FREE Admission Coupon By Clicking HERE! **2nd drop of 7:00-8:00 – only an hour, no clothes, car seats or shoes! 50% off items WITHOUT a star for ALL Shoppers! "the taggers are extremely helpful - and they allow me to participate in sale, otherwise I would not have time to get it all together !" Easy drop off. I like the computer system for tagging. "I love everything about this sale, from the friendly owner and crew members to the organization, efficient set up of the sale! Gretchin does numerous activities and promotions to increase foot traffic and show her appreciation to customers, throughout the sale. If you don’t consign or shop this sale, I think you are truly missing out. "